Crewmember from the 2013 HI-SEAS study. Photo courtesy Angelo Vermeulen. Test a hypothesis that group cohesion over the short term predicts team performance over the long term. Observe how technical, social and task roles evolve over long-duration missions. Establish baselines for a wide range of human cognitive, social and emotional factors over missions of varying durations. These types of studies are essential for NASA to understand how teams of astronauts will perform on long-duration space exploration missions, such as those that will be required for human travel to Mars. The studies will also allow researchers to recommend strategies for crew composition for such missions, and to determine how best to support such crews while they are working in space. 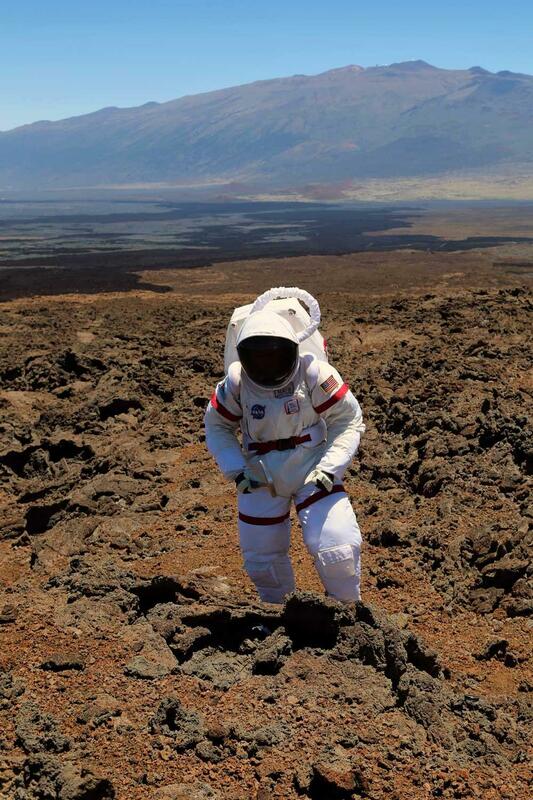 The upcoming missions will be conducted at the Hawaiʻi Space Exploration Analog and Simulation (HI-SEAS) site, an isolated Mars-like environment on the slopes of Mauna Loa on the Big Island of Hawai‘i at approximately 8,200 feet above sea level. Crewmember participants will live in the same modern geodesic dome habitat that successfully supported a NASA-funded Mars food study that garnered national media attention in 2013 ( for more information about that mission, please see http://hi-seas.org). The upcoming missions are focused on evaluating the social, interpersonal and cognitive factors that affect team performance over time. Researchers from outside of the space analog habitat will monitor each mission to evaluate the communications strategies, crew work load and job sharing, and conflict resolution/conflict management approaches that contribute to the success of a long-duration mission. Like the astronaut mission specialists they will represent, each participant will be expected to bring a significant research project or other scholarly work of his or her own to complete while inside the space analog habitat – for instance, biological or geological field research, engineering design and technology evaluation, scholarly writing, or artistic endeavors compatible with the limitations of small living quarters in an isolated location with limited internet bandwidth. Subjects will be compensated for their participation and for associated travel and housing costs. Successful applicants will be placed into a pool from which researchers will assemble three well-balanced teams for the various study periods. Applicants must be between 21 and 65 years of age. They must be tobacco-free, able to pass a Class 2 flight physical examination, and able to understand, speak and write fluently in English. They must meet the basic requirements of the NASA astronaut program (i.e. an undergraduate degree in a science or engineering discipline, three years of experience or graduate study, etc. ); in addition, they will be evaluated for experience considered valuable in the program, such as experience in complex operational environments. Pre-screening will be carried out by a panel of experts who are familiar with the astronaut selection process, but who are not involved in the rest of the study. Candidates selected for further evaluation and screening will be contacted by e-mail to schedule a screening. There will be no charge to applicants for any screening procedures, and no risks in these procedures over and above those of daily life. The deadline for applications is November 1, 2013. Instructions for applicants are posted at http://hi-seas.org.